Cable Knit - Adding Exciting Dimensions To Your Projects! I've always enjoy working with cable knitting. It gives me something to look forward to instead of doing plain knit and purl. I love seeing the end result of it. It's such an amazing thing to see how cable knitting can create beautiful depths and dimensions that bring knitting to life. Before you get started, you'll need a cable needle for this. You can also use double pointed needle as a substitute for cable needle as well. There are so many patterns of cable knit and I don't even know what to pick. I'm using 4 stitch-cable and 9-stitch-plait (shown below) as examples here so that you can see and get an idea of how cable stitches are made. Other cable patterns you can find here are Oxo Ripple Panel, Celtic Plait Panel and 6-stitch Plait I used for the school vest. I will gradually add more cable panels in my knitting stitch patterns page. So don't forget to check often to see more cable panel patterns. 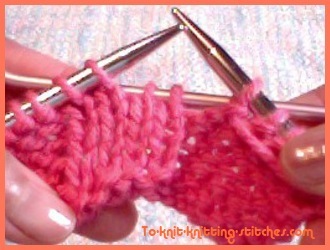 How to knit 4-stitch CABLE with LEFT stitches crossing over RIGHT stitches. 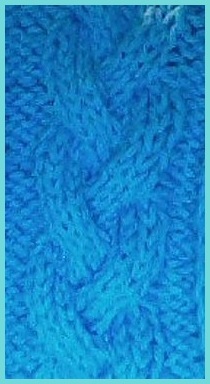 This image shows an example of 4-sts cable knit. 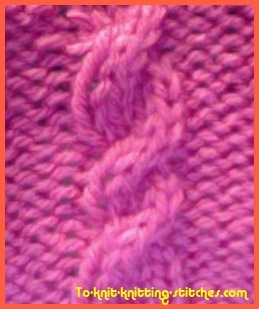 In this cable pattern, the cables are form on row 3 and 5, therefore create short and long twists. Begin with Casting on 14 stitches. This image shows holding 2 sts at back of work with a cable needle. 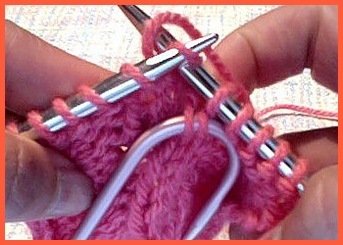 This image shows knitting a stitch from left needle before knitting off the cable needle. Repeat row 1- 6 to form a long ribbing pattern. Binding off on the right side. 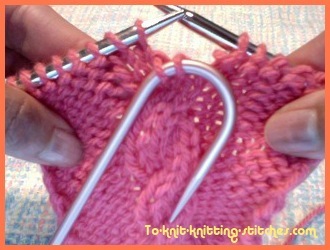 How to knit 4-stitch CABLE with RIGHT stitches crossing over LEFT stitches. This image shows cable needle holing 2 non working sts at front of work. 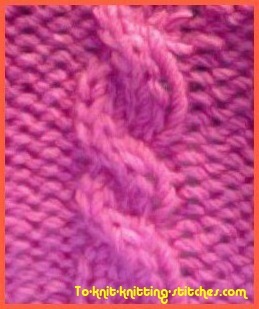 This image shows knitting st off left needle while skipping the 2 sts on the cable needle. 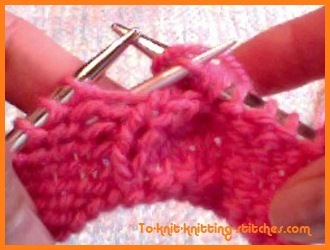 You'll have 2 right sts crossing over 2 left sts cable knit as and end result (see picture below). 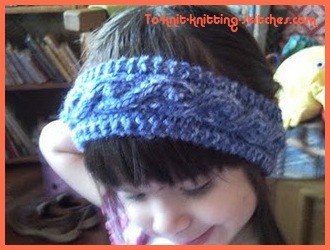 Here is an example of bobble cable headband I knitted. You can get this pattern at Bobble Cable Headband. Make a cable headband using bobble cable pattern above. Knit an inch less than head circumference then binding off all stitches. Leaving 10 inches yarn behind for sewing. Sew two ends together using tapestry needle. Weave the end of yarn behind stitches. Note: Cable knit works best with a purled background. When knitting cable on knitted background, purl a few stitches before begin the cable. Row 2 and every alt row: Purl. Repeat these 8 rows to form a long plait. 6CB = Cable 6 Back (Do the same as C6F but leave next 3 stitches on a cable needle at the back of work.